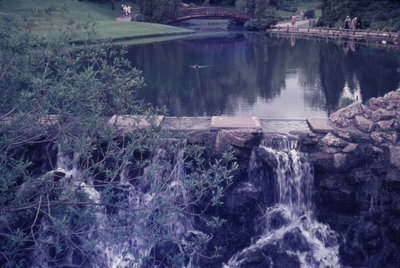 A colour slide of Wilket Creek in Toronto, Ontario. In this view the creek flows in to a waterfall. Leonard Beckley was born in Bude, Cornwall, England on 17 September 1905. He immigrated to Canada in 1910 with his parents, Richard and Jane, and his three brothers Herbert, Victor and Edgar. The family would move to 509 Beech Street circa 1916. He married Elizabeth (Betty) Ellen Roberts (1901-1984) and they did not have any children. Mr. Beckley was an avid photographer, taking photographs of flowers, changing seasons, and events of Whitby. He also documented his family vacations to historic places through photographs. His other passion was gardening which was reflected in his “Old English” garden. Wilket Creek, July 1978, Leonard Beckley. Whitby Archives A2014_004_109. Scanned from a colour slide.